Sanjay Saverimuttu’s And Don’t Talk About It.Photo by Sam English. When Robert Curran states in his opening remarks that this program will make you feel like you are “in” the dance and not just watching it, it is exactly the point of Studio Connections. 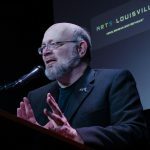 This year Curran structures the show to illustrate both fundamental concepts behind ballet and contemporary dance and a bit of the Louisville Ballet’s history since he took over. If this company is new to you (for shame), and even if it is not, it is a tidy and informative primer that is well positioned as the season opener. The ten pieces mostly alternate classical and modern sensibility, with Brandon Ragland’s Allegro Brio providing a spritely opening to showcase company trainees. The young women acquit themselves well, signaling a strong future with a company that can boast even greater cultural diversity and an increased range of body types. The program ends with a reprise of the final scenes from the Louisville-set Coppelia (ch: Arthur Saint-Leon) from 2 seasons ago, a look back that emphasizes Curran’s desire to connect more fully to the community through collaboration and history. The Pas de deux, Coda, and Finale feature impressive work from Kristopher Wojtera and Annie Honebrink. Another pas de deux, from the venerable Swan Lake (ch: Marius Petipa), was a bravura turn for Christy Corbitt and Ryan Stokes, and Spectre de la Rose (ch: Michael Fokine) was a touchingly simple fantasy, but also a succinct example of how profoundly fairy tales tap into our deepest held sense of longing. Christy Corbitt and Phillip Velinov execute the tale with great charm. Other duets were Asaf Messerer’s Spring Waters, a lovely and lyrical piece performed by Emmarose Atwood and Ryan Stokes. Mr. Curran’s introduction to the piece noted the importance of trust in such pairings, and this particular dance, although unusually brief, stood out for the daring of the lifts and exchanges in the choreography, with a final lift that was startling. Another legendary pas de deux, from Serge Lifar’s Suite en Blanc, is a touchstone for contemporary dancers, and a piece that proved challenging for Natalia Ashikhmina and Roger Creel. La Bayadere – Kingdom of the Shades (ch: Petipa) is another classical piece marked by a lengthy entrance of the “Shades,” a procession of uniform ballerinas who move with precision, filling the stage in an almost military repetition that manages to remain engaging because the formality, curiously, gives us time to examine each member of the corps individually. Studio Connections removes the veneer of effortlessness that can come with the slight remove of Whitney Auditorium and allows the hard work, stress, and sweat to be highlighted as much as the grace and fluidity. In this instance, I was struck by the impression of difficulty that was more pronounced in the classical work, trembling in the lifts enough to conjure suspense. Yet that sense was missing in the modern work, replaced by human conflict and narrative tension in the most striking dances of the program. The Heart of Light, the Silence (ch: Justin Michael Hogan), uses T.S. Eliot’s The Wasteland to frame an abstract work about addiction. The spoken word element (recorded by actors Jon Patrick O’Brien and Dara Jade Tiller) at times seems an uneasy fit, with the focus pulled between the words and the movement, but finally the context informs our understanding of the choreography. Sanjay Saverimuttu’s And Don’t Talk About It was an exciting expression of what Mr. Curran described as “toxic masculinity,” the theme of Fight Club boiled down to a visceral thumbnail. 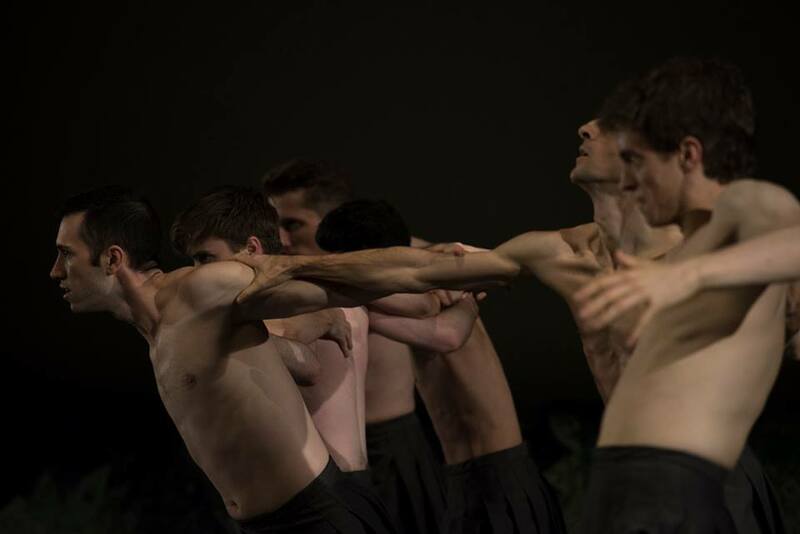 Eight male dancers clad in skirts maneuver forward in a tight skirmish line, and the interactions chart a trajectory of conflict resulting in a tragedy that doesn’t just call behavioral conventions for men into question but condemns them. Following in the tradition of Troy Games, but with a distinct lack of humor, it is a severe and powerful indictment. 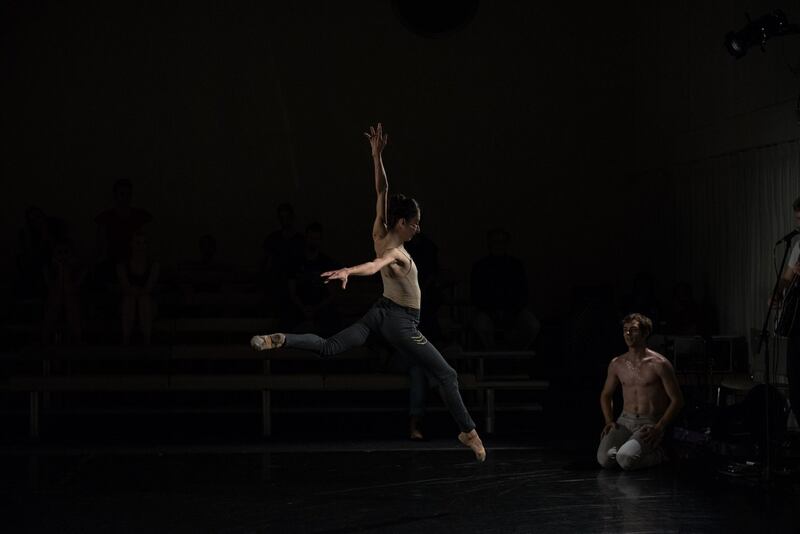 Adam Houghland’s Cold Virtues – Second Movement has a similar abstract quality in the choreography, but with a more complex narrative set during the Great Depression. For me, this was the most exceptional and dynamic choreography of the program, delivered in what seemed like flawless fashion by an ensemble led by Principal Couples Kateryna Sellers, Mark Krieger, Leigh Anne Albrechta, & Benjamin Wetzel. I saw no trembling stress in the dancers’ bodies, but there was great pathos in their faces, a reminder that modern dance often requires the dancer to also be an actor. Ms. Albrechta and Ms. Sellers both excel in this, capturing the emotion that is carried through in the daring movement, limbs akimbo in angular forms that show the character’s desperation. 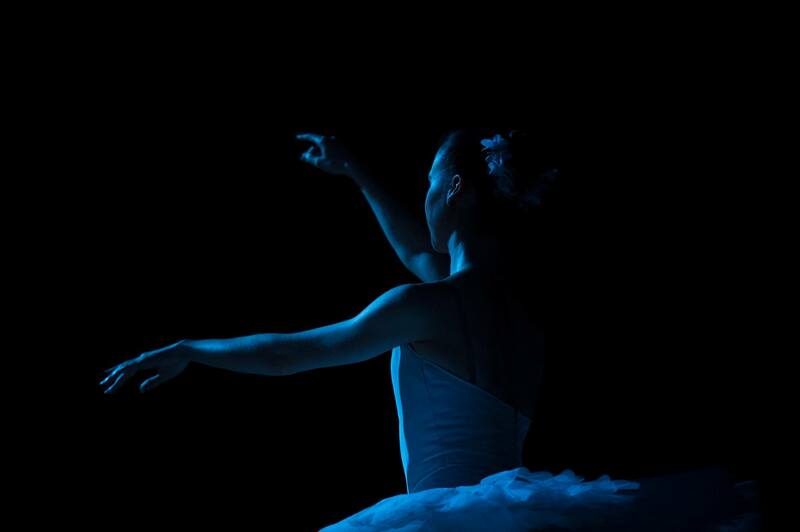 Performances in the Louisville Ballet Studios are always a tool for expanding our understanding and appreciation of dance in general and the Louisville Ballet company in particular. Mr.Curran’s commentary introducing each piece was welcoming and affectionate for his audience and his dancers and choreographers, giving appropriate respect to all and extending a hand to newcomers. One gets the feeling that he does not take anything for granted about the company and its position in the Louisville community, and is still hungry to prove the value and importance of his vision for the future of Louisville Ballet. PreviousIs An Artist The Sum Of Their Parts?